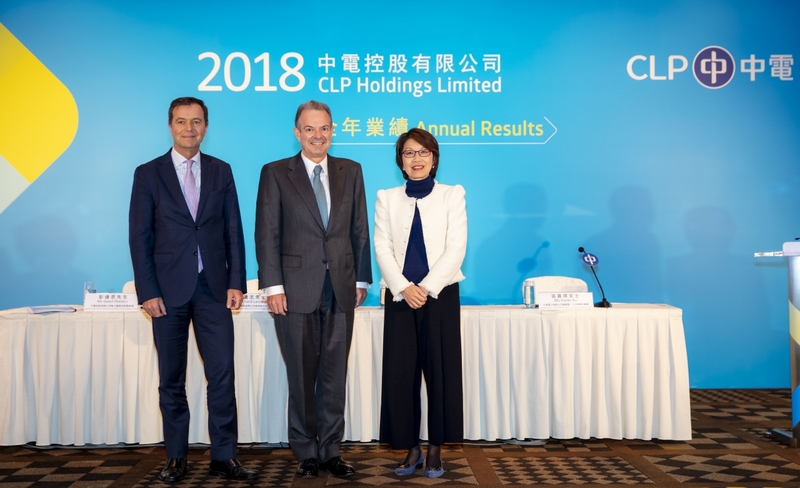 February 25, 2019 /3BL Media/ CLP Holdings Limited (CLP) is pleased to announce solid annual results for 2018. The Group’s operating earnings for the year increased 5.1% to HK$13,982 million. Total earnings decreased by 4.9% to HK$13,550 million, largely due to favourable one-off items in 2017. These figures reflected the combination of continued robust performance in our overseas businesses and dependable earnings from our Hong Kong base. They also allowed the Board to approve a fourth interim dividend of HK$1.19 a share. Total dividends per share for 2018 are HK$3.02, a 3.8% increase from 2017. “It is the fifth year in a row that CLP has achieved growth in earnings as we continued to deliver on our purpose of providing secure, affordable and sustainable energy to our customers. As we face climate change, our strategy is to transform into a Utility of the Future which engages directly with customers and progressively decarbonises the portfolio using new technologies. I am very pleased that we made further strides in this direction over the course of 2018,” said Richard Lancaster, Chief Executive Officer of CLP, at the Group’s 2018 annual results announcement media briefing. In 2018, our customer numbers increased from approximately 2.56 million to 2.60 million. Sales of electricity within Hong Kong rose slightly by 1.5% compared with the previous year, driven mainly by demand from the commercial, and infrastructure and public services sectors. Sales to Mainland China decreased as our contract to supply electricity to Shekou in southern China expired in June 2018. As a result, total electricity sales in 2018 saw a marginal decrease of 0.8%. During the year, operating earnings from our electricity business decreased 3.4% from the previous year to HK$8,558 million as the new 15-year Scheme of Control (SoC) Agreement came into effect from October with a permitted rate of return set at 8.00% compared with 9.99% previously. The Agreement provides a clear and certain regulatory framework for the future development of the electricity sector in Hong Kong, enabling us to plan ahead and make the appropriate investments to meet the Government’s energy policy objectives. The first 5-year Development Plan under the Agreement provides for a capital spending of HK$52.9 billion. The investments contemplated under the plan will help us support Hong Kong in meeting its carbon reduction goals and ensure supply security. Expansion of our Black Point Power Station with two advanced combined-cycle gas turbine generation units enables the gradual retirement of the four oldest coal-fired units at Castle Peak Power Station. Meanwhile, we are constructing an offshore LNG terminal that will improve the diversity, and thus the security and cost competitiveness, of future gas supplies. The new SoC Agreement is our greenest so far and includes important initiatives to promote local renewable energy development, energy efficiency, and conservation. A Feed-in Tariff scheme, Renewable Energy Certificates, and a new CLP Eco Building Fund were launched to support these goals. Our power system experienced one of the biggest challenges in its history in September 2018 when Hong Kong was battered by Typhoon Mangkhut, the most powerful storm to hit the city for decades. Although our generation units and power grid remained intact and power supplies to the majority of our customers were maintained, the severity of the storm and its consequential damage to our network in rural areas were unprecedented. Power supplies to some of our customers were affected, in particular those in remote areas. Despite the enormous challenges, our employees and contractor workers carried out the restoration work safely and efficiently, with an aim to bring power back to the affected customers in the shortest time possible. The effectiveness of the response was testament to the investment we have made in strengthening our infrastructure over the years, and underscored our commitment to serve customers reliably in the most extreme situations. Hong Kong is our home and CLP’s core market. We will work tirelessly to deliver the 5-year Development Plan in support of the Government’s carbon reduction targets and environmental policies, while providing the vital electricity infrastructure needed to ensure a reliable and stable electricity supply for Hong Kong’s continuing dynamic development. As Hong Kong transforms itself into a smart city, we will play our part by providing a greener, smarter and highly reliable energy system whether through direct investments or by acting as a coordinator for others. We will connect different trades and industries and help them adopt smart, green solutions that meet their business needs and use energy wisely. We continued to support Mainland China’s transition to a low-carbon economy through our investments in nuclear and renewable energy sources, which contributed the bulk of our earnings in the country. Yangjiang Nuclear Power Station in Guangdong for the first time made a meaningful contribution to our earnings, following the completion of the acquisition of our 17% equity interest in the facility in December 2017. The operation of Daya Bay Nuclear Power Station remained strong and our long-term investment in the plant continued to constitute a stable component of the Group’s earnings. In 2018 our Mainland China renewables portfolio benefitted from ample wind and sun resources, lower grid curtailment and the addition of both new wind and solar projects. Our renewable portfolio now amounts to over 1,700MW while zero-carbon generating capacity (including nuclear) is more than 4,200MW. Performance of Fangchenggang Power Station improved, reporting higher output as it benefitted from the economic growth in Guangxi Autonomous Region and less competition from hydro generation. However, our coal projects continued to face the triple challenge of high coal cost, low tariffs and low utilisation. Operating earnings for the year were up 74.7% to HK$2,163 million, driven by the growth and strong operating performance of our zero-carbon assets. Earnings from our nuclear projects, the biggest contributor to the total, saw an increase of 88.4%. Mainland China is one of CLP’s key growth markets. Looking forward, our focus will continue to be the expansion of our low-carbon portfolio. We will continue to pursue new projects in a disciplined and selective manner. With the planned commissioning of the whole of the Yangjiang plant by 2019, we expect low-carbon projects to remain the key drivers for our business in Mainland China. At the same time, we will continue our efforts to increase utilisation of the Fangchenggang plant. As our innovation initiatives in Hong Kong and Australia begin to reap results, we hope to apply the experiences to Mainland China, particularly in the Greater Bay Area. We will seek to explore further partnerships in independent decentralised generation and distribution to deliver more technology-enabled energy solutions to our business partners and customers. 2018 was a significant year for CLP India. We introduced Caisse de dépôt et placement du Québec (CDPQ) as our strategic shareholder to focus on jointly expanding our green energy investment in the country. Operationally, the business continued to report a stable performance. While operating earnings decreased 11.6% to HK$572 million, earnings from our renewable energy portfolio grew. During the year, energy produced by our renewable energy assets in India was the highest ever, as resources were more favourable than usual, the availability of our assets had been high and the Veltoor solar project made its first full-year contribution. Our coal-fired Jhajjar facility performed well despite a longer-than-projected planned outage. Utilisation rate and sent-out reached new records, reflecting the importance of our asset in responding to growing demand. Unfortunately, we continued to be affected by coal shortage and quality issues in connection with the industry’s logistic challenges at large. The Power Purchase Agreement for our gas-fired Paguthan power plant expired in December 2018. This is an excellent asset and we continue to explore long-term options for the project, although the lack of affordable natural gas makes this challenging. The Indian electricity market is expected to report sustained growth in the coming years on the back of healthy economic expansion nationwide and continued efforts to achieve access to electricity for all citizens. This provides a sound foundation for CLP in one of our major growth markets. In agreement with our new partner CDPQ, we intend to focus on growing CLP India’s non-carbon generating business, particularly in renewable energy and transmission. The partnership provides strong financial resources for growth from the business’s existing platform. Our operations in Taiwan returned to normal after the completion of a planned major overhaul at the Ho-Ping coal-fired power plant. The Lopburi solar plant in Thailand recorded stable and satisfactory operations. In 2018, operating earnings in Southeast Asia and Taiwan reached HK$162 million. In the past decade, Vietnam’s policy has called for coal-fired generating plants to support its economic growth. In 2018, our negotiations with authorities continued regarding commercial and financial arrangements for the Vung Ang II and the Vinh Tan III projects. As a reliable partner, CLP continues to assist Vietnam and its utility to explore options to progress these two legacy developments. However, we note that the availability of international financing for new coal facilities is becoming increasingly difficult to secure and we are mindful of the changing international context and the commitments we have made under our Climate Vision 2050. The Australian retail market in 2018 was very competitive. Market churn was high across all the states in which EnergyAustralia operates with Government intervention stimulating heightened competition for mass-market customers and increased market transfer activity. To ease pressure on customer bills, EnergyAustralia decided to absorb some of the rising costs in parts of the energy chain. While EnergyAustralia’s churn remained below the market average, we made fewer sales and margins were put under pressure. Customer accounts decreased by 73,300 or 2.8%. 2018 was again a year of very tight supply-demand balance, resulting in high wholesale prices while our generating assets continued to perform well. During the year EnergyAustralia acquired additional flexible capacity, in the Newport and Jeeralang gas-fired plants, for an enterprise value of A$205 million and invested around A$144 million in maintenance and upgrades to our generation assets. Overall, driven by high wholesale prices and high sent-out, operating earnings from EnergyAustralia increased 20.6% from a year earlier to HK$3,302 million. Going forward, we expect competition in the retail market to remain intense. Against this background, we will continue our focus on improving customer experience and easing pressure on household budgets. Operationally, our focus will remain on optimising our generation portfolio, enhancing asset reliability and exploring the integration of flexible capacity options, including storage and gas-fired generation. It will remain our priority to work with Federal and State Governments and advocate for a clear and stable national energy policy. This will provide the confidence for the investment required to transition Australia to a more reliable, affordable and sustainable energy system. EnergyAustralia is committed to contributing to those investments to safeguard the reliability and affordability of our power supply as the country moves towards a low-carbon future. Safety always comes first at CLP. We were saddened by the deaths of one employee and one worker of our contractor in Australia in 2018. In 2017 we carried out a thorough review of our health and safety practices under the supervision of the Board, which approved a new Health, Safety and Environment Improvement Plan in May 2018. Our goal is to raise our safety culture, rethink our risks, and build a healthy and engaged workforce. The fatal accidents remind us that we must continue to relentlessly develop our efforts to understand the cause of such tragic accidents and prevent them. Recognising what the digital evolution means to the world and our industry, we have made innovation a priority in our long-term goals for the Group. Seeing it as a key enabler for our transition, we have made direct investments to bring in the best-of-breed technologies for optimising our existing operations and developing new products and services for our customers. We are also committed to developing the right tools for our customers so that they can have more visibility and control of their energy usage. And we have teamed up with new partners including start-ups and universities to speed up the development of smarter and cleaner energy services. By combining our extensive experience, capability and partnership network developed through various innovation initiatives over the past few years, CLP has already laid a solid foundation for developing customer-oriented and technology-enabled energy solutions. We are well-positioned to take advantage of the accelerating pace of technological advance and respond to climate change in an industry with positive growth prospects. For more details, please refer to the full version of “Announcement of Annual Results from 1 January 2018 to 31 December 2018, Dividend Declaration and Closure of Books”.